Our guiding principle is the highest quality – Immer Besser is our common goal. We are the only manufacturer to test our products for a service life of up to 30,000 operating hours. Whether it be analytically pure laboratory glassware or laundry freshly washed daily for guests, our guiding principle has driven us for more than 115 years to develop the best solutions for our customers, so that they in turn can offer customers the best results. Quality you can rely on: Miele Professional appliances are developed by Miele engineers and the carefully selected components are largely produced in our own competence centers in Germany and Europe. For us, German engineering primarily means that we go into the details extremely carefully. And that we make every effort even for the smallest of improvements. This means that we are able to guarantee the highest level of product service life and 100% quality in everything that we do, which cannot be matched by anyone else in the industry. The Miele Professional efficiency advantage pays off in the long term. If you consider the costs over the whole service life of our products, you will see how economically you can run our appliances. Therefore German engineering also means the greatest level of efficiency for our customers: long service life, low consumption of water and energy, combined with quick and reliable work processes and durable problem-free technology. Whatever the demands made of our appliances, the powerful performance and durability of our robust machine constructions cannot fail to impress. All of our products undergo a final test run and only once they have passed every test with flying colors are they ready for daily use. They run and run and run, so that our customers can concentrate on their business, confident of delivering perfect results. Miele Professional appliances offer numerous intelligent functions and can be adapted to suit the needs of every individual situation. Many of these processes run automatically, but it is the freedom of choice in the program parameters that makes operating our appliances so quick and intuitive. Simple user instructions in our clear text displays answer all your questions and ensure consistent user confidence and safety. Our service begins even before the products are delivered. Thanks to a careful needs analysis, together with process planning and detailed efficiency calculations. Together with our customers, we create specific concepts for individual cases. This results in a needs-oriented system solution that guarantees safe processes. Our service staff are always available for our customers during working hours. Thanks to our individually tailored service program with maintenance contracts, we offer a preventive service. Inspections, servicing and maintenance result in safe and reliable work processes when maintaining the value of the appliance, thus securing your investment. However, if something should happen, our comprehensive Miele Professional service network can react extremely quickly. Miele Professional concentrates on the manufacturing of commercial products for industries using commercial dishwashers, commercial laundry technology and laboratory and dental technology. Wherever innovative high-end products with an outstanding cleaning performance and high hygiene requirements are needed, Miele Professional wants to be the first choice. 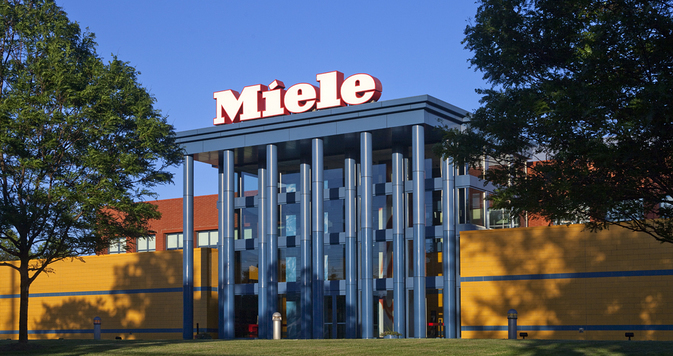 For more than 90 years, commercially used products have been another area of success for Miele & Cie. KG. In the beginning, this was in the form of large washers, then came the dishwashers and since the 1960s medical products too. Since the year 2000, Miele Professional has developed from being just a product manufacturer to a system provider for commercial solutions.